On Monday, in the morning, police officers of the Municipal Police Headquarters, together with the mascot – a gigantic ant, set out to meet the first-graders. They visited primary school No. 5, 8 and 15 in Tarnow, where they taught children how to safely reach and return from school and recalled the need to put on glare while moving around the roads. All the little ones received a sweet surprise and what’s important – reflective vests, thanks to which they will be visible after dark. Over the coming month, the police officers conducting the campaign “Safe Road to School with Ant” will reach a large plush ant to nearly 80 primary schools and will provide nearly 2,000 first-graders with reflective materials that ensure their safety on the roads. 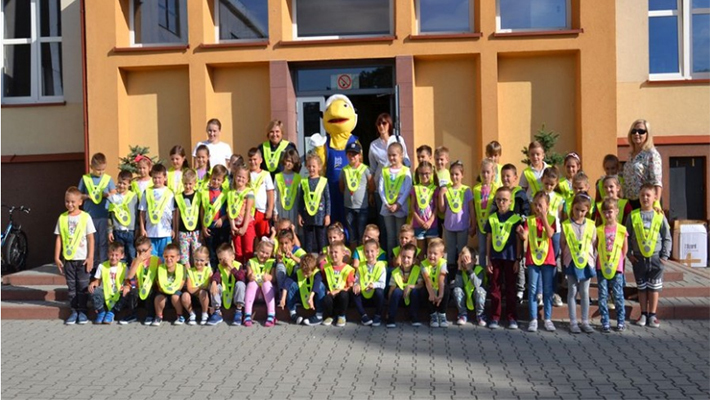 Police officers of the prevention and traffic department of the municipal headquarters, together with a partner, the mascot, started the campaign “Safe way to school with an ant” dedicated to children who started their education in the first grades of primary schools this year. The aim of the planned series of meetings is to make young road users aware of the risks they can face every day on their way to and from school as well as education in the field of their effective avoidance. Classes include theoretical and practical part. Children learn the rules of safe use of pedestrian crossings and traffic lights, learn about road signs and pedestrians ‘and cyclists’ traffic regulations. Then they practice acquired skills in practice. They are helped by educational materials funded by the active partner, including mobile “zebra”. An important point of meetings with police officers is also the consolidation in the consciousness of the young people of the need to use reflections after dark. Choosing the schools that will visit the police officers is not accidental. For the purpose of the campaign launched yesterday, nearly 80 educational institutions were selected, located in the area of busy and dangerous roads. It is also worth mentioning that “Safe Way to School with an Ant”, organized by the Police for the fourth time, is part of a long-term strategy aimed at increasing the safety of the youngest road users. From the very beginning, we have been partnered by the mascot – a gigantic ant. Thanks to her help and support, we manage to reach more and more schools every year. This year’s edition of the campaign, equipped with reflective vests which made of the reflective fabric, will be close to 2 thousand first graders.